Right now we are waiting for new Alan Kingsbury Limited Edition Prints to arrive at the gallery. In the meantime, here is a selection of the artist's archived art work which has featured at Red Rag Art Gallery. If you wish to register to receive updates and alerts when new art work from Alan Kingsbury arrives select this link. 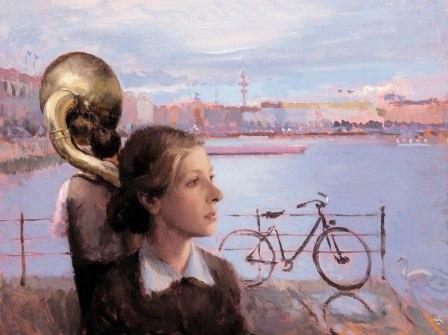 Alan Kingsbury was born in London in 1960. He began painting in oils at the age of nine. Alan Kingsbury studied psychology and art history at the University of Wales taking his degree in psychology in 1982. Unconvinced of the usefulness of attending art school Alan spent a further year of full time study of art history in London, specialising in old master and modern European painting. In 1983 Alan Kingsbury was offered a student internship at the Peggy Guggenheim Collection in Venice which enabled him to paint and study the art and architecture in the city. Following this he took up the post of cataloguer of modern paintings at Bonhams fine art auctioneers in London. During this time Kingsbury was able to look at hundreds of paintings each week in galleries and auction houses thus gaining a wide knowledge for detail and effect in painting. In 1986 Alan Kingsbury left London to pursue his career as an artist. Initially he returned to Venice where he worked daily outdoors, painting oil sketches of the architecture in varying light conditions. At the end of this year Alan moved to Dumfriesshire in Scotland where he spent the subsequent five years developing his painting style and refining his technique. It was here that he began to compose his characteristic imaginative figure subjects. All Alan Kingsbury limited edition prints from Red Rag Art Gallery have been reviewed by the artist. This guarantees that all prints offered by Red Rag satisfy the high quality and fine art standards set by Alan Kingsbury for prints. Each limited edition print series from the Red Rag British Art Gallery is available for immediate delivery and can be shipped worldwide.